Last month, Intel announced the “Basin Falls Refresh” for their Core X-Series HEDT processors. Seven new parts were announced with the flagship of the series being the Intel Core i9-9980XE 18-core, 36-thread processor that is the successor to the Intel Core i9-7980XE 18-core, 36-thread processor launched just last year. Architecturally, the Core i9-9980XE is very similar to its Core i9-7980XE predecessor, but is made on the latest 14nm++ manufacturing process. The improvements on this node along with the switch to solder thermal interface material (STIM) have allowed Intel to increase base/boost clock speeds. For example, the Core i9-7980XE has a base clock of 2.6GHz and a max turbo boost of 4.2GHz. The new Core i9-9980XE has a 3.0GHz base clock with a max turbo frequency of 4.4GHz. So, Intel was able to get an extra 400MHz on the base clock and 200MHz on the turbo clock. Other than that the processors are pretty much identical on paper as they both have 18 cores/36 threads, 24.75MB of Intel Smart Cache, support for quad channel DDR4-2666 DRAM, 44 PCIe lanes, a 165 Watt TDP rating and are fully unlocked desktop processors. Actually, the other difference worth noting between these two high core count processors is that Intel has pulled back the price ever so slightly. The Intel Core i9-7980XE was launched at sobering $1999 and is currently available for $1,903.16 shipped on Amazon. Intel heard the feedback from the community that pricing was getting out of hand and decided to throw us a bone by reducing the price of their flagship processor to $1979. So, having eighteen cores and thirty six threads of performance is going to be reserved for content creators and performance enthusiast with deep pockets. 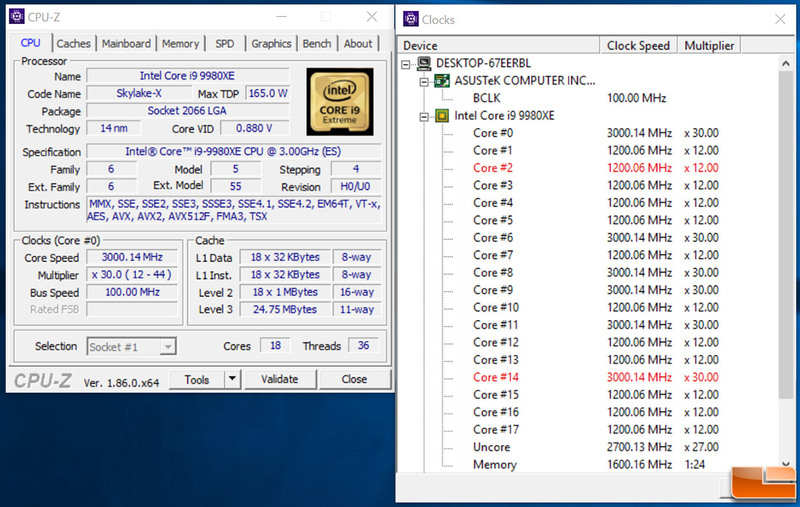 Intel recently send out the Intel Core i9-9980XE X-Series processor for us to take for a test spin and we’ve been putting it through its paces. All seven of the new Intel Core X-Series HEDT CPUs work on existing Intel X299 chipset based motherboards. 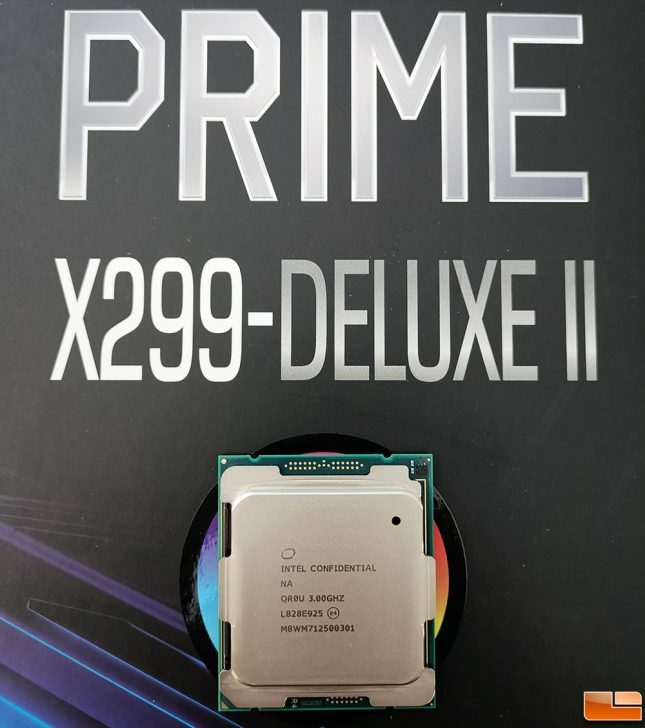 Our X299 workhorse here at Legit Reviews has been the ASUS PRIME X299-DELUXE motherboard. This board came out in June 2017 for around $489 and can be purchased now for $399 shipped after slowly coming down in price since its release. It’s a solid board and with the latest UEFI/BIOS version you’ll be able to run any of the Core X-Series processors. Existing ASUS X299 motherboard owners will need to update their boards firmware UEFI version 1503 from August 2018 or newer to add support for the latest Skylake-X processor family. ASUS is also releasing new X299 boards for this launch and one of those would happen to be the ASUS PRIME X299-DELUXE II at $499. ASUS has really beefed up the power delivery on this board with a new 12-phase power design and improved VRM and memory trace paths for the latest processors. They also went with 2 x 8-pin ATX 12V Power connectors on this board and both of these power jacks use solid pins based on the latest ASUS ‘Pro Cool’ design to best handle the 12V current that is flowing to the processor. 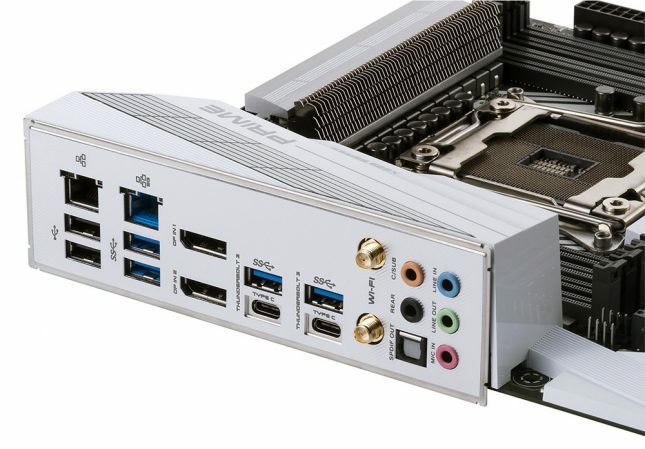 The ‘old’ ASUS PRIME X299-DELUXE has an 8-phase power design with 1 x 4-pin and 1 x 8-pin ATX 12V Power connectors with solid pins. The DELUXE II board also adds some sweet new connectivity features like Aquantia AQC111C 5G LAN as well as two Intel Thunderbolt 3 ports (type C) that allow for 40 Gbps data transfers, 15 Watt charging and up to 12 Thunderbolt devices to be daisy-chained together on this board. 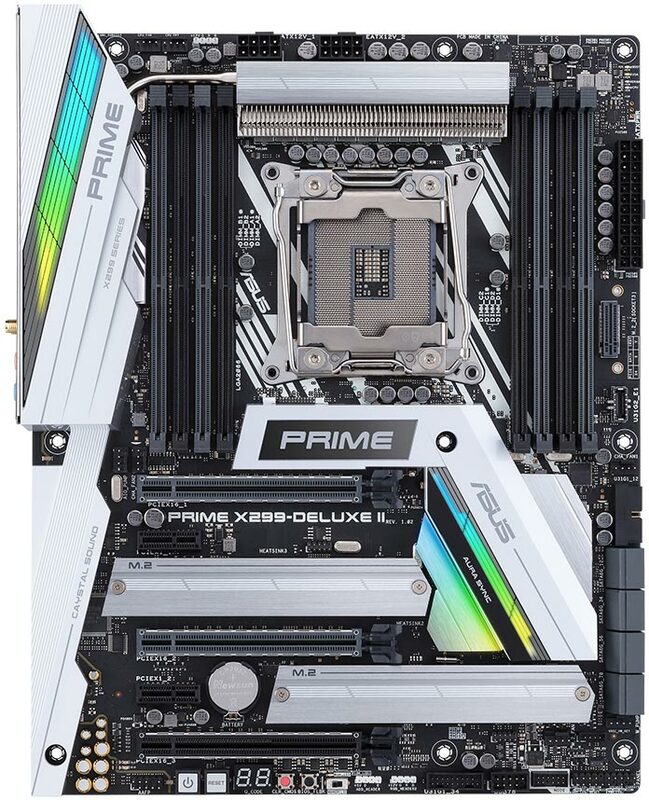 Although, unlike ASUS’ last generation of X299 boards, the Prime X299-Deluxe II drops support for four-core Kaby Lake-X CPUs. This was done to better optimize for the higher-core count processors and we don’t think too many people are going to gripe about that. So, the ASUS PRIME X299-DELUXE II doesn’t support quad-core processors, but has improved power design and includes new cutting edge features like 5G LAN and Thunderbolt 3. The launch price on this board is $499 as we already mentioned, but we expect it to come down in price over time just like the original Deluxe board. We should also point out that you’ll likely need to enable SVID (Serial Voltage Identification) if using MCE (Multi-Core Enhancement) or an Intel XMP (Intel Extreme Memory Profile) and ASUS AI Tuner is not set to Auto, otherwise there likely won’t be much of a performance difference with MCE on or off. ASUS is being rather conservative with the settings until they thoroughly tested all the new Intel 9th Gen Core CPUs and we respect that. Let’s take a quick look at the test systems and move onto benchmarking!